This is a Partial Set of State Express Cigarette Cards entitled 'Speed In Aviation' - in total 15 cards. 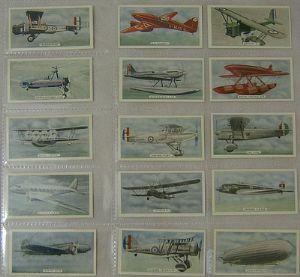 The complete Set of 'Speed Land Sea & Air' is 50 cards which are currently available here under their various 'themes' and any purchaser want the entire set, there would be discounts over the 4 lots. These were originally introduced in the 1930s. The complete set is in a sealed Polyprotec folder, each one individually separated. Each is in perfect condition.